MY CONCLUSION is therefore that the intercepted Hermann Höfle signal is an authentic document, and that its content has not been reverse-engineered from the Korherr report; and that it is a pivotal document in the history of where the real Holocaust operations were taking place. I GO OVER to the Public Records Office (PRO) at one-thirty pm to photograph the page of HW 16/65 which Steve Tyas identified. It does seem to clinch the matter of whether the Höfle document is authentic or not, always assuming that this second reference document is not also a fake; but I think that unlikely. My brief examination of the latter document -- its paper, other pages, typewriter-face, and pencil jottings on it -- strongly suggests that it is contemporary with the other documents in that file. 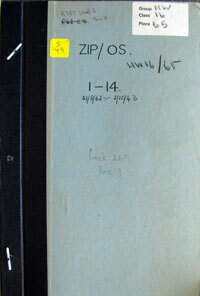 Several years ago, Tyas was the "hobby historian" (as the Germans dismissively refer to those of us who have never bothered with degrees and other academic fripperies and garnishings), who chanced upon the Höfle message in the files of decoded German SS and Police messages here at Kew. There are at least a million of them, and not surprisingly few of the academic historians have ventured to read the volumes, offering various pretexts and excuses. Tyas has waded through most of them, and so have I. His dismissive attitude apart, I shall offer no criticism of him other than that he lacks the degree of scepticism and prudence which seems called for when looking at any new documents about the Nazi killing operations against the Jews. In short, he is gullible, in my view, and I am not. But he is the one who found the Höfle telegram, and published a paper about it in Holocaust & Genocide Studies, a learned journal on which my good friend Dr John Fox also used to sit until ... but that is another story. So, hats off to him. To the Senior Commander of the Security Police [and the Security Service], for the attention of SS Obersturmbannfuhrer HEIM, CRACOW. Subject: fortnightly report Einsatz REINHART. That seven digit total, 1,274, 166, is exactly the same as the seven digit total given by Himmler's chief statistician Dr Richard Korherr, for the number of Jews "sent for special treatment in the camps in the Generalgouvernement," i.e. occupied Poland., in his report to Himmler a few weeks later. That seems to be an impressive confirmation of this message's authenticity -- unless of course a counterfeiter simply "reverse-engineeed" the Höfle document and based his seven-digit number on the one given in the (later) Korherr report; that was a possibility which Tyas did not address in his paper, and I think he should have. Unfortunately, as many revisionist experts soon pointed out, the Höfle document bristles with anomalies and even mis-spellings (and bad math). Wartime German signals, particularly those sent by cypher, had to conform with very strict layouts, norms, content, and style laid down by military directives, Intelligence, SigInt and civil service, and this item is significantly delinquent in half a dozen or more respects. Moreover, it mentions Adolf Eichmann, of all people. It is of high security classification, Geheime Reichssache, and I cannot recall having found more than half a dozen of these rare signals in the entire archive. It does not give a proper reference subject ("Reference: radio telegram therefrom"), because it does not risk offering a Registry-number or even a date of the radio telegram ("Fs.") it is purportedly answering, and much else. And it has been glued into the volume out of page-sequence. Because of its keystone importance in the architecture of the entire revisionist debate, after I myself examined it visually half a dozen times, I asked the Public Records Office in June of this year if they would carry out a -- necessarily invasive -- forensic test on the document. 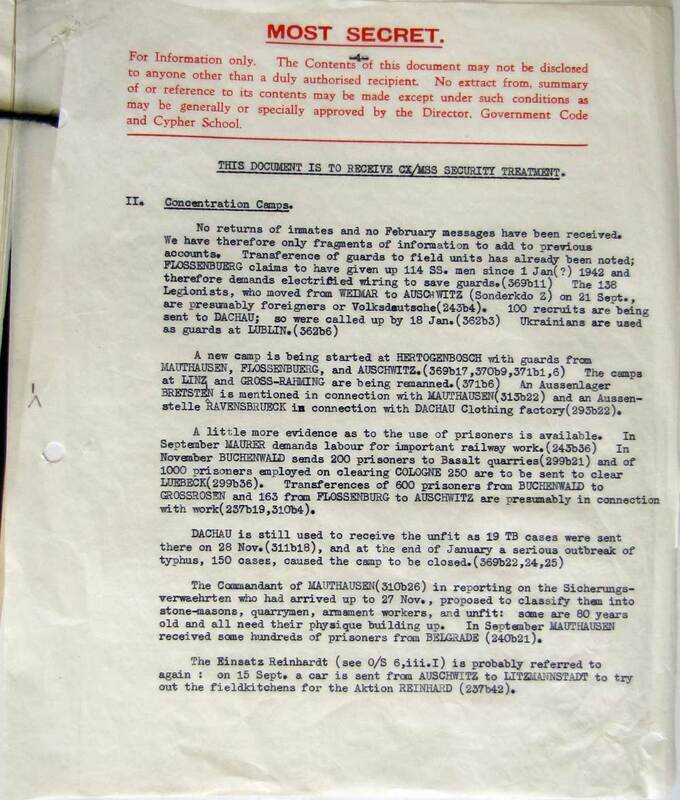 THEN, as my readers know, Steve Tyas mentioned he had more recently found another wartime British document referring to, and summarising, the Höfle document. That completely changed the picture, and I put my PRO request on hold, pending my own scrutiny of this new evidence. 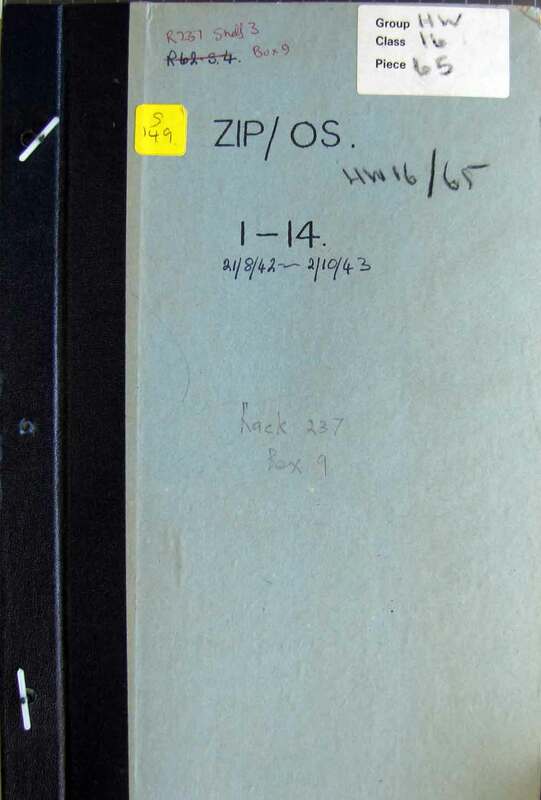 The new reference is in this folder (left), which was unfortunately released by Britain's secret archives to the public domain only after Tyas's original paper on the subject. (i): Einsatz Reinhardt. SS und Pol.Fuehrer Lublin sends the Befehlshaber der Sipo Krakau a report on Einsatz Reinhardt for the 14 days up to 31.1.42. [sic] Increase to 31.12.42: L12761, B 0, S515, T 10335, altogether 23611. Totals on 31.12.42: L24733, B 434508, S 101370, T 71355: altogether 1274166 (355a 13)." [sic] is our comment. It should read 31.12.42. Note that there is no comment or interpretation whatever on this, and it is the last on a page of miscellaneous items, of very trivial matters. 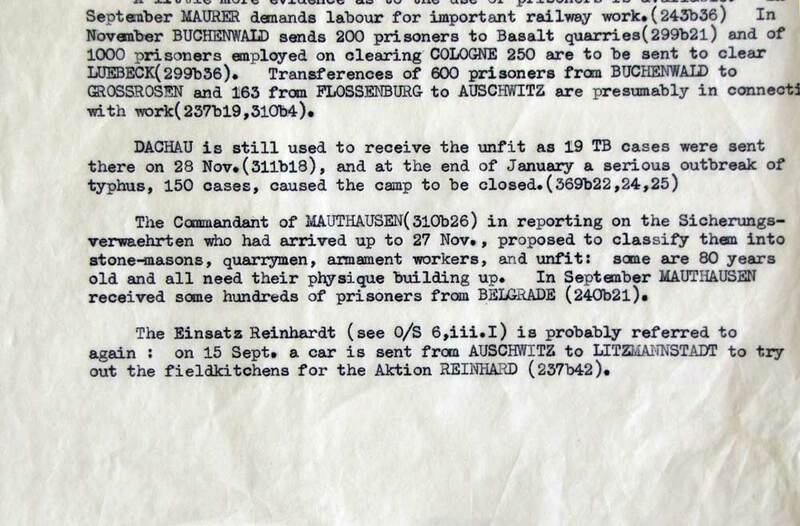 The Einsatz Reinhardt [sic] (see O/S 6, iii.I) is probably referred to again: on 15 Sept. a car is sent from Auschwitz to Litzmannstadt to try out the fieldkitchens for the Aktion Reinhard [sic] 237b42. Our comment: this suggests that the British Intelligence analysts were in January 1943 still in the dark about the real portent of Reinhardt. Incidentally, those who attended the three month Lipstadt Trial in London will recall that the original text of this last document was produced in evidence by Professor Lipstadt's experts on Day 10 (Jan 26, 2000) and Day 12 (Jan 31, 2000) and that they testified that I was wrong to translate the word Feldöfen as field-kitchens. MY CONCLUSION is therefore that the intercepted Hermann Höfle signal is an authentic document, and that its content has not been reverse-engineered from the Korherr report; and that it is a pivotal document in the history of where the real Holocaust operations were taking place; and that this was not at Auschwitz -- a site not even mentioned by the Korherr report incidentally -- but in the Reinhardt sites along the Bug River in eastern Poland.